Many of us will buy a camera because of impending event. A vacation, a wedding, and almost certainly for the arrival of a new baby. 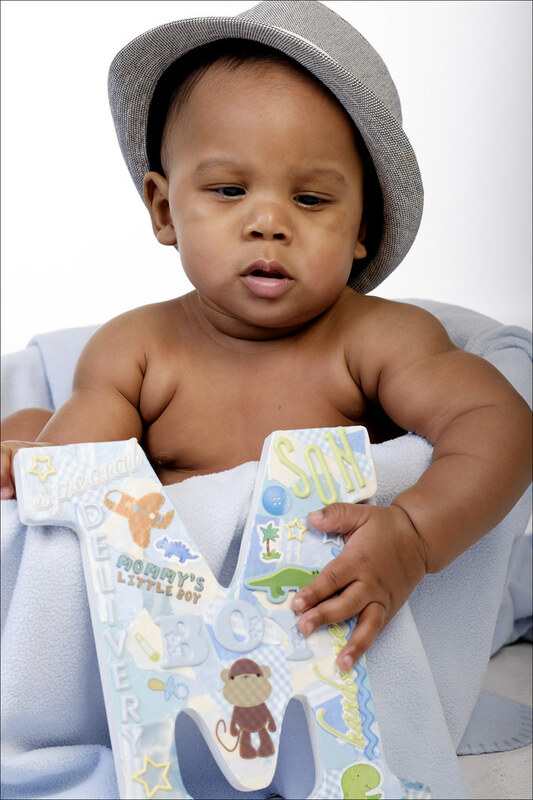 You want to capture those early months and years, and have pictures to treasure for the family. And don’t forget grandma and grandpa, they’ll want photos for the coffee table! I was asked to shoot photos of a 7 month old, and his mum & dad, so figured this was a good opportunity to pass on some tips, and get you the photographs you’re dreaming of, with your shiny new camera. You want the focus to be on the baby, or mum and baby in this case, so keep the background clean and simple to avoid distractions. This can be as simple as shooting against a white wall. Just think about anything that would be in the background of your image, that might distract the viewer. Keep it simple also applies to the clothing and color scheme – the co-ordination of mother and son, and the black and white scheme, really make a statement without being overly complex or fussy, or appearing ‘staged’. 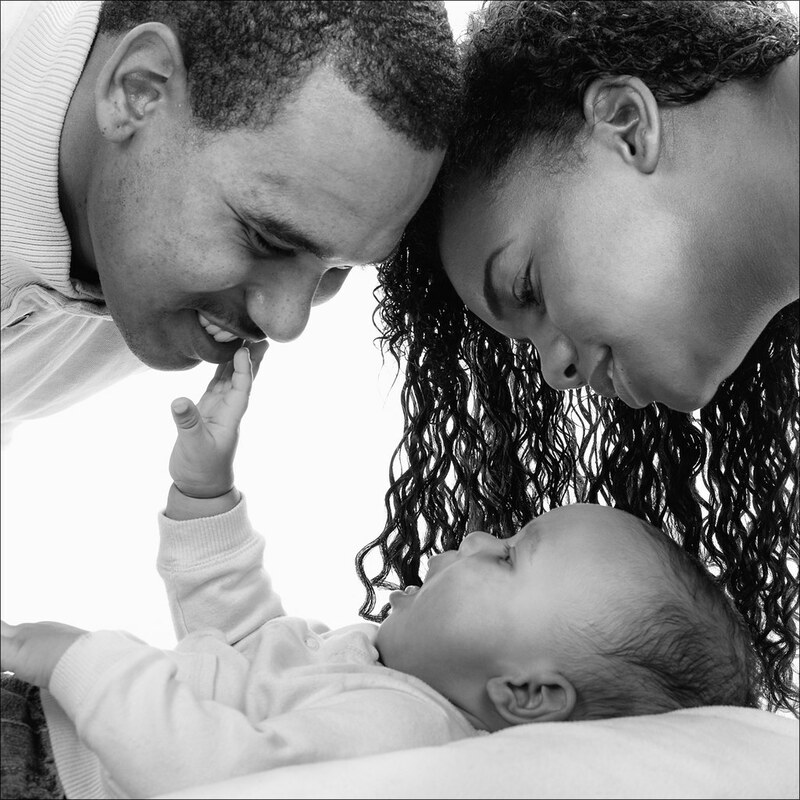 Remember, that you’re trying to convey the wonderful bonds between babies and their parents – so think about how you can show that through the interaction on camera. Here’s a great example. In the first shot, we have a perfectly nice family grouping, with mum, dad and baby all present and correct. Now, take the dad and ask him to wrap his arms around mum and baby, and all of a sudden you’ve transformed the feeling of the shot. You can feel the love. And this transfers to the expressions of your subjects. 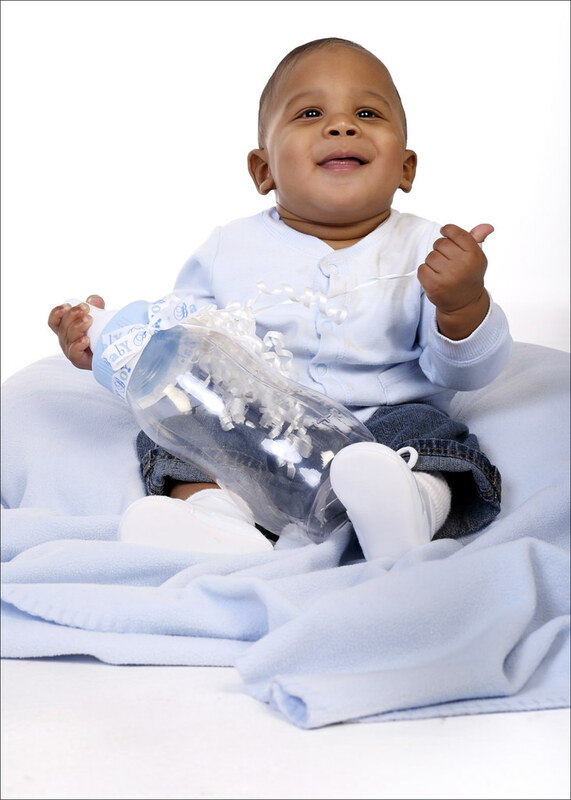 Babies are easily distracted, and you want the star of the show looking towards the camera for his/her big day. You’ll need to have visuals and sound to make the baby look over to camera, and be ready to capture that moment when it happens. 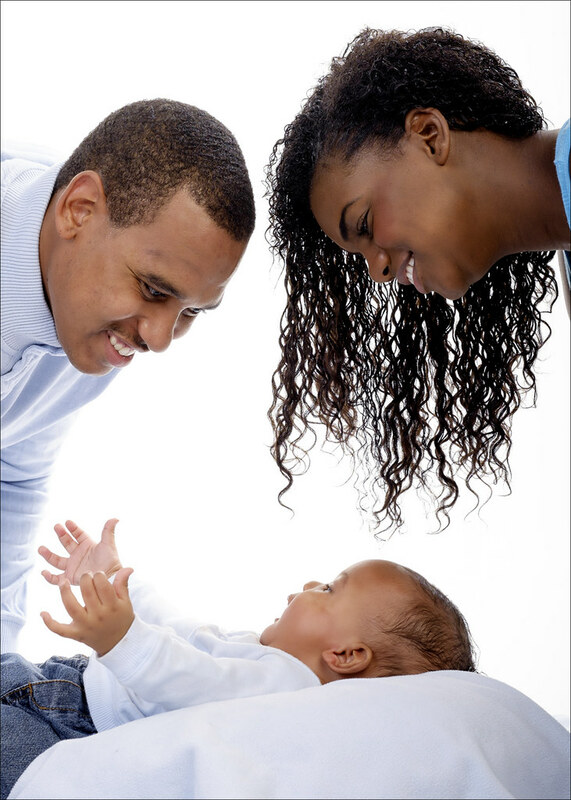 Warn mum and dad that you’ll be grabbing that shot as soon a junior looks your way, so that they are also camera ready and facing front. You can buy little soft toys that attach to the end of your camera lens, to attract young eyes at the right moment. Or get an family member to wave a favorite bear and/or make animal noises from behind you, to attract attention. Think about this before the shoot day – you really need the help to get this piece right, and without it, it’s going to be a lonnnnng day! It’s a special time with baby, but don’t let the baby steal the show completely. 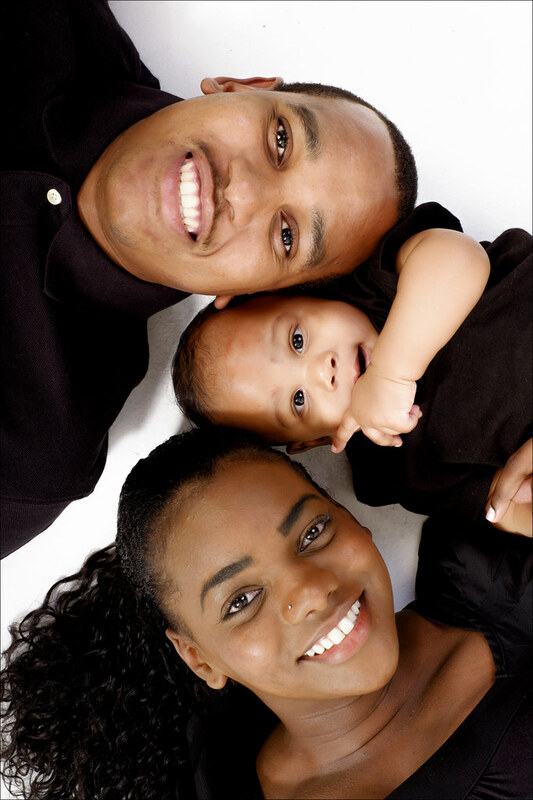 Make sure you get some shots of the happy couple together, while someone else takes care of the baby. Don’t be shy about asking them to cuddle-up and kiss – you’ll be glad you did. Props will make your images personal, and memorable, and with a little planning will be easy to include in the shoot. 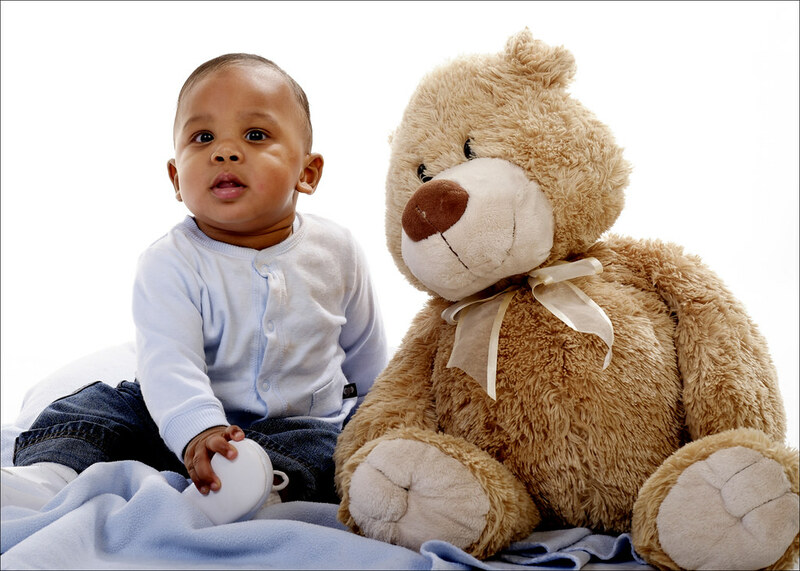 There’s that favorite teddy bear that you got baby – include him while he’s still bigger than your child. Feeding time is a good memory – the oversized bottle emphasize how small junior s at 7 months – don’t forget, he’ll soon be grown, and you’ll have forgotten just how small he was. 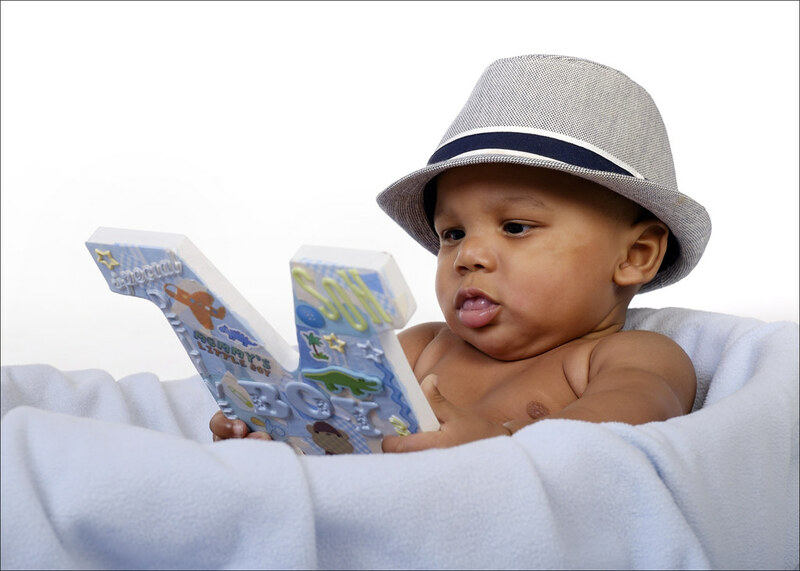 Hats, shades etc are so cute on babies – dress him up and make him look sharp – he’ll thank you for it when he’s 18, and you’re showing the photo to his new girlfriend! 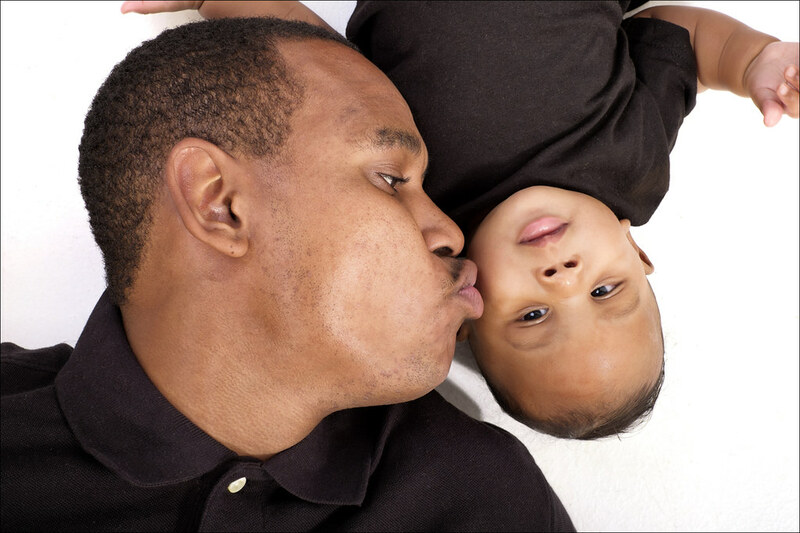 It’s easy to include mum in the shots, baby spends a lot of time with mum at this age – but let’s not forget dad. 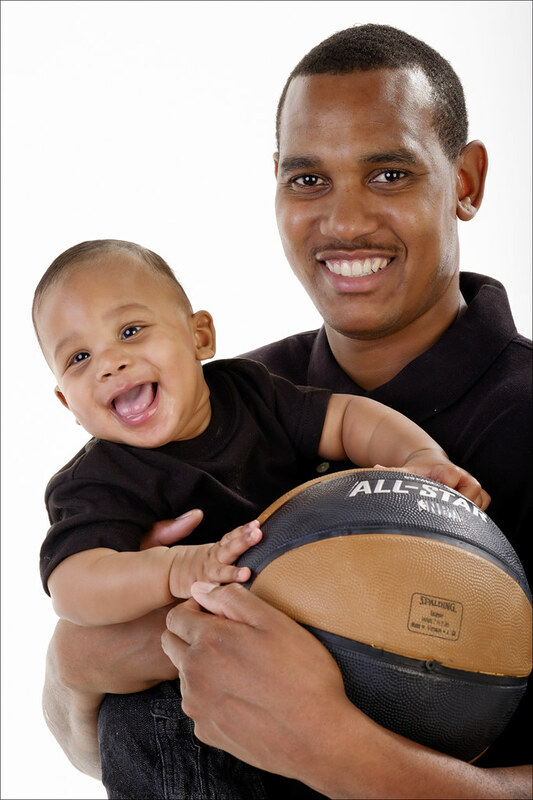 Maybe have dad bring a prop that suggests junior’s future prowess in sports. Or give dad some one on one time with junior during bottle feeding – these make for great photographs, as everyone is relaxed and happy. One of the most common issues with baby shots, is that they are taken from adult height, looking down on baby far below. Get yourself down to baby level. Lie down and shoot at 2 inches off the floor. 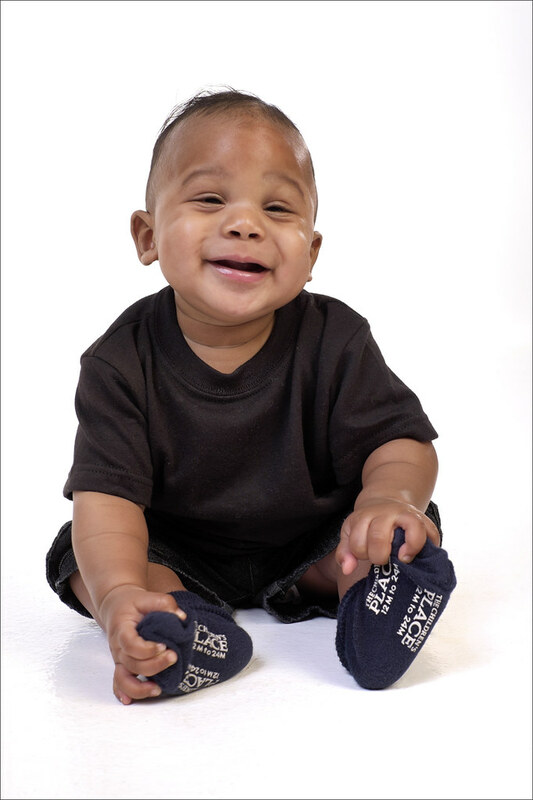 Your shots will look much better, and baby will look like a real individual. Cameras like the X-T1 have a tilting rear LCD, so use that to view the scene as you place the camera on the floor in front of you, and shoot that way. You’ll get a better viewpoint, and you’ll be more comfortable while you’re shooting. Wide angle lenses make people look wide when you get in close. Faces get distorted, noses look bigger than they are, it’s just not a flattering look. You should use a lens with an equivalent focal length of 50mm (full 35mm frame) or longer. So the 35mm lens on your Fuji, or preferably the 56mm portrait lens. The 35mm will still give a little facial distortion close-in, but is good for groups. 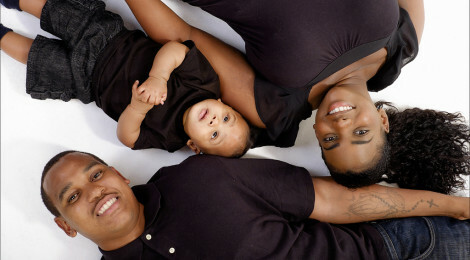 Don’t just line your family up and shoot a passport style shot – have some fun with them, and your compositions. Lie them down on the floor (a nice safe place for baby) and shoot from a set of steps for a great angle. Wrap them all up together, and show the connection – this shot is a sure fire favorite with mum and dad, and the grandparents. Hopefully the tips above will get you thinking, and get you some great shots on the day. I suggest you build out a Pinterest board of family shots you like, and use that as a shot reference on the day, to refresh your ideas, and make sure you capture that look you were after. 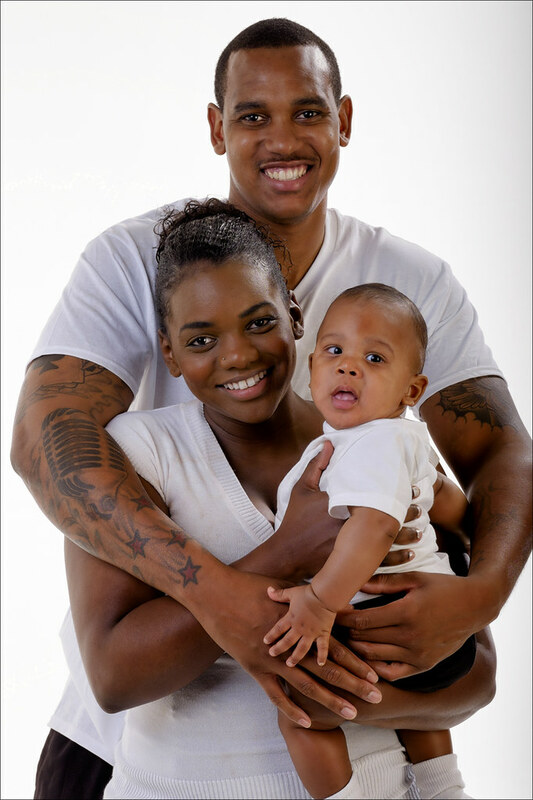 The X-T1, and other X-Series cameras, are capable of producing great family portraits. If you were looking for the justification to pull the trigger on one, you just found it!